Katelyn started working at ProActive Physical Therapy after receiving her Associate of Applied Science degree from Western Iowa Tech Community College. 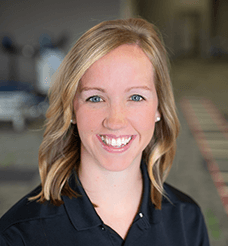 Prior to that, she studied Exercise Science at the University of Northern Iowa where she developed the desire to work in the physical therapy field. Katelyn is passionate about what Physical Therapy can offer people of all ages and health conditions. Outside the clinic, her husband, Troy, and her stay busy raising their three energetic kids. She enjoys spending time with family and friends, being involved in the community through the local schools and church, and staying active outdoors. I get excited about the opportunity to develop a relationship with each patient and implement personalized treatments to help each one reach personal goals. I like the variety of patients I get to work with each day. While growing up in Sioux Center, I had always admired ProActive’s reputation of investing in people and the community as a whole. ProActive Physical Therapy is active in the community and the schools and I am excited to be part of that. I like the variety of each day and the opportunity to treat a wide range of patients from young athletes to geriatric patients. I would like all patients to walk away knowing they were heard and cared for, and realizing that we are truly invested in their health.